Port and Shipping Minister Arjuna Ranathunga said he plans to bring the Colombo Port to be among the top 20 global container ports. He said every possible step has been taken to facilitate all employees and staff of the institution to perform their fullest duty towards Sri Lanka Ports Authority without disputes and as same as the previous year. Sri Lanka Ports Authority (SLPA) Chairman Dammika Ranathunga said the institution is by now acquiring a rapid progress. He said compared to the decrease in TEU operations in 2015, marking Singapore at 8%, Salala 18%, Hamburg 11.7%, the growth of the Port of Colombo was marked at 5.9%. 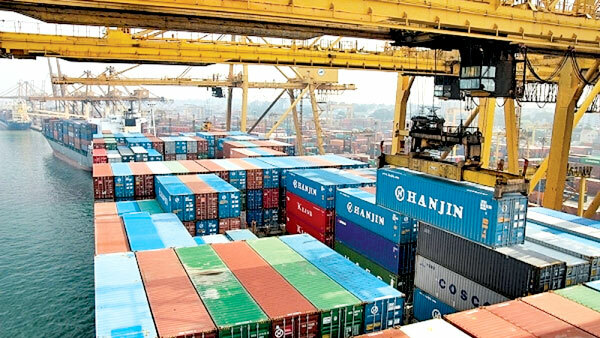 At the same time he said that the domestic operations have increased by 8.3% and transshipment TEU operations by 5.4%. The Chairman also stated that the usual productivity of Gantry cranes at the Jaya Container Terminal (JCT) of SLPA for January 2015 which was 20 TEUs per hour had been increased up to 26 TEUS per hour by November 2015. “We expect to accomplish construction of the East Terminal, purchase machinery and other equipment to commence operations in 2016. As a result of marketing and business promotion strategies, SLPA will enter into six MOUs with main global shipping lines in 2015. Hence, three main lines and four feeder services were attracted to the JCT. At the end 2015, the JCT won the ISO: 9001/2008 Quality Management Certification in Container Terminal Management and Operations as a result of the improved efficiency at the SLPA terminals.